The Gallery presents the story of Dr David Livingstone. The main themes include Livingstone's early life, his missionary work at Khuruman, his early travels to Lake Ngami and the upper Zambezi River, his Trans-African journey on which he became the first white man to see the Falls known to the local people as Musi-oa-Tunya or Shuungu-na-mutitima, which he named "Victoria Falls". The gallery takes the visitor on a fascinating journey through the history of Zambia from 1550 to 2001. The exhibition pays attention to the earliest historical evidence, focusing on the origins of the people in Zambia, early chiefdoms and Kingdoms, early contacts with the people of the outside world, European explorations and missionary activities in Zambia. The theme echoes the present imbalance in the country's development endeavours. Most people trace their origins from villages, although many now live in towns. The gallery exhibits a variety of Zambian animals and plants shown in their natural habitat, including insects, other invertebrates, frogs, reptiles, fish, birds, mammals and plants. 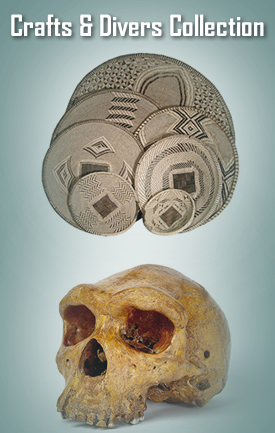 The gallery describes the story of human evolution and cultural development in Zambia from Stone Age to Iron Age. Exhibits show shifts in prehistoric technology and its application in food procurement production and preparation. Mufuzi, F. 2011 "A Zambian Glory under the Microscope: A Brief History of the Livingstone Museum", The Bulletin and Record, (February 2011), 27-31. Mufuzi, F. 2011 "Establishment of the Livingstone Museum and its role in colonial Zambia, 1934 - 1964", Historia, 56, 1 (May 2011), 26 - 41. Research in the section has recently concentrated on the distribution of snake and lizard species in Zambia.